To Share with you today.. 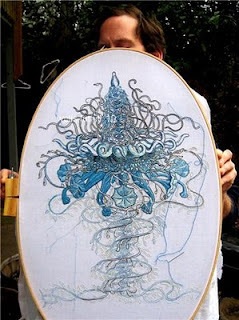 I was looking at this great blog and there is an ammmmazing embroidery artist who's work is really inspiring and cool. I found a really cool interview with the artist on a blog called Faster kittykill! Blog! Blog! I know.. weird right? But the artistry in this embroidery is jaw dropping and mouth salivating. That may be a messy combination but it certainly is beautiful work. It definitely makes me wonder what else I could do with some embroidery thread..